Founded in March 1945, the League of Arab States (or Arab League) is a loose confederation of twenty-two Arab nations, including Palestine, whose broad mission is to improve coordination among its members on matters of common interest. The League was chartered in response to concerns about postwar colonial divisions of territory as well as strong opposition to the emergence of a Jewish state in Palestine, but it has long been criticized for disunity and poor governance. Critics also say it has traditionally been more representative of its various autocratic regimes than of Arab citizens. The organization had the opportunity to advance social interests with the push for Palestinian statehood at the UN and the unrest in many Arab countries in 2011. Some critics see positive developments in the League’s actions in Libya, where it supported a no-fly zone and the ouster of Muammar al-Qaddafi, and in Syria, where it orchestrated a fact-finding mission to observe the conflict and called on President Bashar al-Assad to step down after months of deadly clashes with protesters. 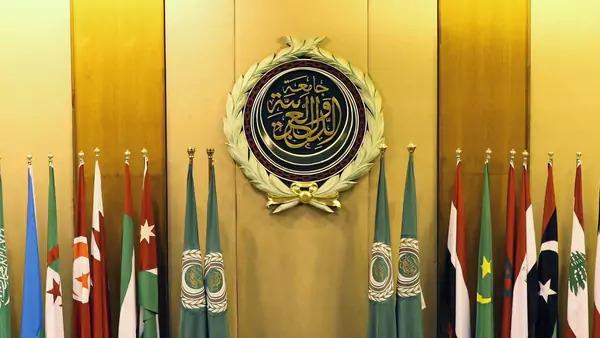 According to its charter, the founding members of the Arab League (Egypt, Syria, Transjordan, Iraq, Saudi Arabia, Lebanon, and Yemen) agreed to seek "close cooperation" on matters of economics, communication, culture, nationality, social welfare, and health. They renounced violence for the settlement of conflicts between members and empowered League offices to mediate in such disputes, as well as in those with non-members. Signatories agreed to collaborate in military affairs; this accord was strengthened with a 1950 pact committing members to treat acts of aggression on any member state as an act against all. The charter established the Arab League headquarters in Cairo, created a permanent General Secretariat, and scheduled sessions to meet biannually, or at the request of two members in extraordinary circumstances. A formal commitment to international human rights law entered League conventions in 2004 (it was ratified in 2008) when some members adopted the Arab Charter on Human Rights. The charter has an annex on the issue of Palestine. It affirms Palestinian independence and states that "even though the outward signs of this independence have remained veiled as a result of force majeure," an Arab delegate from Palestine should "participate in [the League’s] work until this country enjoys actual independence." The Arab League has no mechanism to compel members’ compliance with its resolutions, a void that has led critics like NYU Associate Professor Mohamad Bazzi to describe the organization as a "glorified debating society." The charter states that decisions reached by a majority "shall bind only those [states] that accept them," which places a premium on national sovereignty and limits the League’s ability to take collective action. While some actions are taken under the aegis of the Arab League, they are executed only by a small faction. Bazzi says, "During the Lebanese civil war, the Arab League had limited success trying to help negotiate a peace, but in the end it was the individual powers, in this case Syria and Saudi Arabia, that helped end the conflict by convening the Taif Agreement. Technically it was under League auspices, but it was really Saudi Arabia and Syria as the driving force." The concept of an integrated Arab polity based on shared culture and historical experience, which is at the heart of the Arab League’s charter, dates to the Islamic caliphates under the disciples of Mohammed. Modern pan-Arabism, or Arab nationalism, arose in opposition to Ottoman rule and nineteenth-century attempts to impose the Turkic language and culture on Arab subjects. During World War I, the Sharif of Mecca led an Arab revolt against the Ottomans in concert with British forces. The British government assured Arabs their support would be rewarded with the establishment of an independent state. However, a separate Anglo-French accord signed in 1916, known as the Sykes-Picot Agreement, betrayed this plan and carved up Arab lands into respective spheres of influence. During World War II, the British once again pledged "full support" for Arab unity. This policy was expressed by Foreign Secretary Anthony Eden in his Mansion House speech in May 1941. Encouraged by the news, Arab leaders embarked on negotiations for a pan-Arab union that would bolster support for the Arabs of Palestine. The process culminated in 1944 with the Alexandria Protocol, the document that laid plans for the Arab League. In 1948, five nations of the newly formed regional body took up arms against the state of Israel following its declaration of independence. The conflict marked the first major action of the League and the first of several bloody conflicts between Arab and Israeli forces over the future of Palestine. The resulting Arab defeat, known as the Nakba or "catastrophe," was a defining moment. In his 1996 book Palestine and the Arab-Israeli Conflict, Charles D. Smith writes, "Many, especially of the younger generation, saw Israel’s existence as symbolic of Arab humiliation at the hands of a superior power relying on Western technology that they were denied. Here there existed a desire for revenge coupled with the fear of Israeli military might and possible future expansion." The Palestinian issue continues to be a catalyst for collective Arab action. The League emphasized the importance of the Palestinian cause in 1964 with the establishment of the Palestinian Liberation Order, whose charter states "the liberation of Palestine, from an Arab viewpoint, is a national duty." Following another significant defeat by the Israelis in 1967, the League issued the Khartoum Resolution, often remembered for its three "nos": "no peace with Israel, no recognition of Israel, no negotiations with it." The Arab League has maintained an official boycott of Israeli goods and companies since 1948, but measuring the effects of the ban is difficult due to lax enforcement and limited trade flows. Still, policies toward the Jewish nation did not develop uniformly. These postures, as well as relations with one another, were shaped by factors including individual territorial ambitions, evolving Cold War alliances, and inter-Arab rivalries. After WWII, the pan-Arab project gained its most charismatic champion in Egyptian leader Gamal Abdel Nasser, but several critical international developments over the following decades exposed the limits of League solidarity. The decline of British and French colonial empires and the emergence of a bipolar Cold War altered the architecture of power in the region. Inter-Arab antagonisms, the strategic implications of Mideast oil, and a U.S. policy of Soviet containment provided ample seeds of conflict for the newly formed League. During the Lebanese civil war, the Arab League had limited success trying to help negotiate a peace. Under Nasser’s leadership, Arab nationalism reached new heights. Nasser’s ascent to power in 1952, in the Arab world’s first military coup, was seen as a victory against Western imperialism and an inspiration to other Arab states. Still, the pan-Arabism project suffered several setbacks under his reign. The brief political union of Egypt and Syria, known as the United Arab Republic, fell apart after only three years (1958-1961). The outbreak of civil war in Yemen in 1962 deteriorated into a disastrous eight-year proxy battle between Egyptian and Saudi-backed forces. Even Palestine proved to be a source of contention as Arab League members vied to assert control over the PLO. "Arab politics were more chaotic than at any point in modern history. Nasser’s revolution promised unity—but delivered fragmentation and discord," wrote Michael Scott Doran in Foreign Affairs in 2011. Perhaps the most pivotal event of the period was Egypt’s nationalization of the Suez Canal in 1956. The ensuing crisis, while perceived as a victory for Nasser in the Arab world, convinced the Eisenhower administration to pursue a proactive role in the Middle East, and primed the region for Cold War polarization. Washington provided economic and military assistance, primarily to Israel, to counter similar flows of Soviet assistance to Egypt, Iraq, and Syria. This arms race culminated in the Six-Day War (1967), a defeat for Arab armies that included the Israeli occupation of the remnants of Arab Palestine. The decision by Egyptian President Anwar Sadat to open unilateral peace negotiations with Israel in 1979 further underscored Arab divisions. As a result, Egypt was suspended from the Arab League (but was readmitted in 1989). The Arab League continues to struggle with disunity and dysfunction, and critics question whether the organization has any relevance in its current form. Though it achieved notable consensus over the Saudi-sponsored Arab Peace Initiative in 2002, the League failed to coordinate its policy over both the 1990-1991 Gulf War and the 2003 Iraq War. Interviews conducted by al-Jazeera in 2009 illustrated the Arab public’s frustration with the organization. "If we are to measure competence in terms of results and achievements," said a twenty-four-year old Syrian, "then the Arab League is not competent simply because they have not achieved anything." Even the League’s secretary-general, Nabil al-Araby, joined the chorus of criticism in September 2011, describing the organization as "impotent." The Arab revolts throughout the Middle East and North Africa in 2011 offered the League a new opportunity to reform. Some critics see the appointment of al-Araby as a step toward this end. In a 2011 interview with CFR, Shadi Hamid of the Brookings Institution said, "Here is someone who is more in tune with Arab public opinion, who is respected among Arab activists, protestors, and members of the opposition. He’s not someone who is a stooge of the regime by any stretch of the imagination. All of this suggests that the Arab League is changing." After rare action to topple Qaddafi in 2011, the Arab League turned its focus to the conflict in Syria. It suspended Syrian membership in November 2011, brokered an ill-fated peace agreement with the Assad regime, and, for the first time in its history, assembled a team of observers to monitor the implementation of its plan. Frustrated with a lack of compliance by Syria, the Arab League officially called for Assad to step down in January 2012 and requested a resolution from the UN Security Council to support this proposal. The Arab League eventually recognized the Syrian opposition as the legitimate representative of the Syrian people, but Assad regime allies in the organization such as Iraq, Lebanon, and Algeria blocked the oppositions’ full assumption of the role. Tensions between Sunni and Shia Muslims, exacerbated by wars in Syria and Iraq, are creating new fissures among Arabs. Sunni leaders largely snubbed a 2012 summit in Baghdad, reflecting their rejection of a Shia-led Iraq with close ties to Iran. Those who did attend traded barbs during their speeches, dashing an opportunity to foster closer between Iraq and its Sunni-majority neighbors. Even as the Arab League condemns the Sunni extremist group known as ISIS, and Sunni powers such as Saudi Arabia, Qatar, Jordan, and the United Arab Emirates launch air strikes on the terrorist organization, few Arab countries are willing to coordinate efforts with the Iraqi government. Iraq, for its part, has invited Iranian military advisers and deployed Tehran-funded Shia militias in its battle against ISIS. Many mideast experts say the Arab League is likely to improve little on its record of collective action until members agree to sacrifice some sovereignty and comply with resolutions. And until democracy is the mainstay of the Arab world, the League will continue to struggle with issues of legitimacy. This Congressional Research Report explores the Arab League's boycott of Israel. The Sunni-Shia Divide, a CFR InfoGuide presentation of Islam's sectarian schism, explains the religious root of tensions in the region that hinder unity in Arab countries. This 2011 Atlantic article explores the Arab League's potential for reform and the challenges it faces from its autocratic members.